A new Change4Life campaign is encouraging parents in Leeds to “make a swap when you next shop” to halve their children’s sugar intake. According to Public Health England (PHE), children have already exceeded the maximum recommended sugar intake for an 18 year old by the time they reach their tenth birthday. This is based on their total sugar consumption from the age of two. While children’s sugar intakes have declined slightly in recent years, they are still consuming around 8 excess sugar cubes each day, equivalent to around 2,800 excess sugar cubes per year. Recent data shows that childhood obesity has reached concerning rates with 8.6% of children in reception being obese in Leeds, increasing to 19.1% of children in year 6. Overweight or obese children are more likely to be overweight as adults, increasing their risk of heart disease and some cancers, while more younger people than ever are developing Type 2 diabetes. 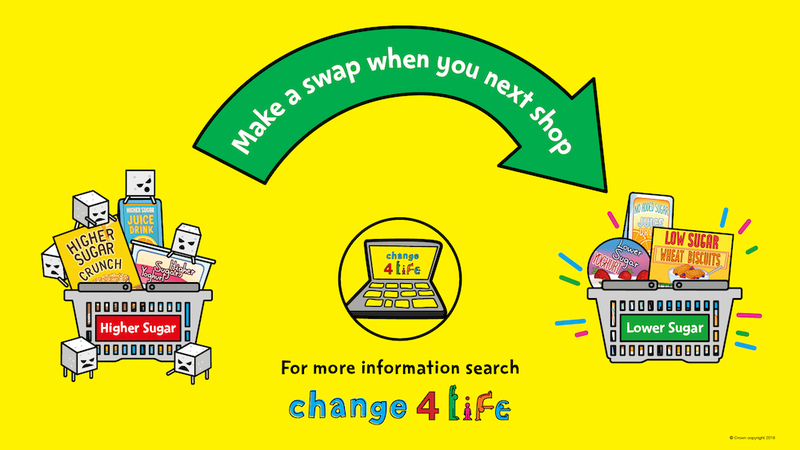 To help parents manage this, Change4Life is encouraging them to “make a swap when you next shop”. Making simple everyday swaps to lower/no sugar products e.g. yoghurts, drinks and breakfast cereals can reduce their children’s sugar intake by half. “Our ambition is that Leeds will be the best city for health and wellbeing. Therefore, we want to make it easy for people to make food choices which reduce their family’s risk of diabetes, heart disease and cancer. “We are encouraging families in Leeds to sign up to the Change4Life website to get some great ideas about swapping foods and to find out more about the sugar content of food and drink products. The Change4Life food scanner app is a great way to help parents to figure out how much sugar is in the products they buy. Popular brands, including Nestlé Shredded Wheat, Nestlé Low Sugar Oat Cheerios, Petits Filous and Soreen (malt loaf) will also be displaying the ‘Good Choice’ badge online, in-store and throughout their advertising, to help parents find healthier options. Customers can also find their healthier options in supporting supermarkets including Asda and Aldi, as well as in Londis and Budgens convenience stores. For more information, including healthier swap ideas, please visit http://po.st/C4LLE.